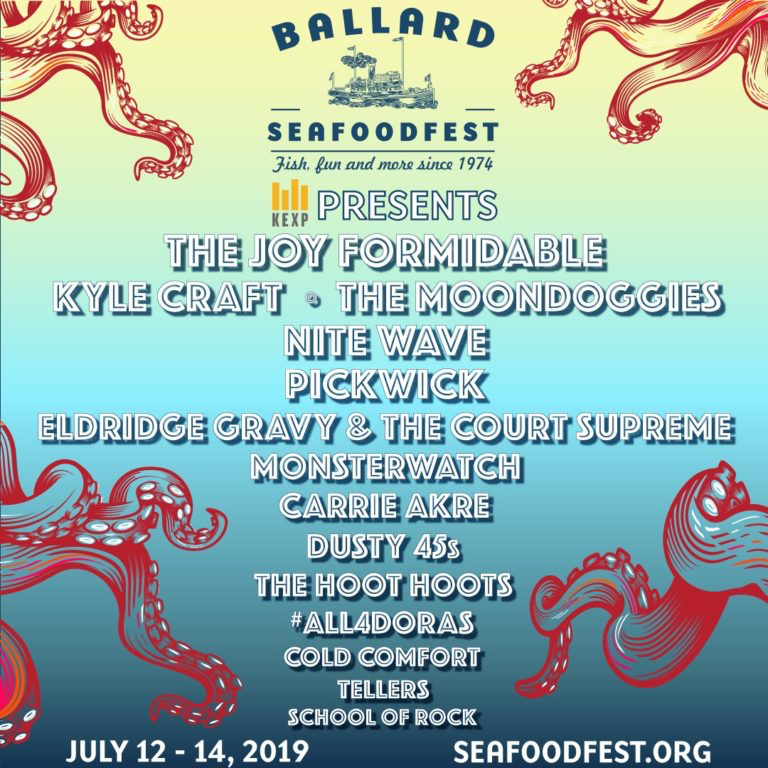 Ballard SeafoodFest is celebrating 45 years as north Seattle’s largest and longest running free festival celebrating seafood, Ballard’s craft beer and great music. There are many local standouts in this year’s music lineup, as well as some stellar international sensations. The 2019 festival headliner band is The Joy Formidable, playing on the Gravity Payments MainStage on Saturday, July 13, 2019. Ballard SeafoodFest began as a neighborhood salmon barbecue and continues to celebrate the rich history and character of Ballard while growing each year. The festival will open with Friday evening’s free all-ages concert featuring Seattle’s favorite 80s cover band, “NiteWave” and “#All4Doras”. For those 21 years and older, the SeafoodFest Beer Garden also opens on Friday evening and several food trucks will be available for all ages. The fun continues on Saturday and Sunday with the full assortment of food, beverages and activities. In addition to the Gravity Payments MainStage musical performances, the Ballard Market Kids’ Deck will take over Ballard Commons Park; Festi-bowl in the Ballard Commons skateboard bowl, an all-ages all-skill levels skateboarding competition; Game Plank, an adult-friendly and dog-friendly play area; the Beer Garden, featuring all locally crafted beers, ciders and cocktails; Crab Shack serving Alaskan crab; hand-crafted arts and crafts vendors; seafood-inspired food vendors; the Lutefisk Eating Competition which promises to gross and delight; and as always, the famous Trident Seafoods sponsored Alder-Smoked Salmon Barbecue. Saturday, July 13, 2019: 11:00 a.m. — 11:00 p.m.
Sunday, July 14, 2019: 11:00 a.m. — 9:00 p.m. The Ballard SeafoodFest has been a production of the Ballard Alliance (formerly the Ballard Chamber of Commerce) since 1974 and is made possible each year by our generous sponsors and dedicated volunteers. All the proceeds from Ballard SeafoodFest are reinvested into the Ballard community through the programs, resources and events offered by the Ballard Alliance. To learn more go to seafoodfest.org.